We think these three certifications go a long way towards broadening the appeal of Empire Coffee products to growing customer segments who are concerned about the quality, safety, and environmental impact of the coffee they drink. When you browse through our wide selection of coffees, you’ll do so with the peace of mind that you’re looking at products that meet the high standards of three different rigorous certifications. Enjoy! SQF stands for Safe Quality Food. It’s a set of global food safety and quality standards (and the only one that combines both safety and quality) recognized by retailers and foodservice providers everywhere for its rigorous approach and requirements. The American National Standards Institute (ASI) provides certification services for three levels of SQF certification. Level 1 is mostly for low risk products and fundamental food safety controls. Level 2 is a certified HACCP (a special kind of food safety management system) that is benchmarked by the Global Food Safety Initiative (GFSI). Level 3 involves a comprehensive implementation of safety and quality management systems that include and go further than Level 2. 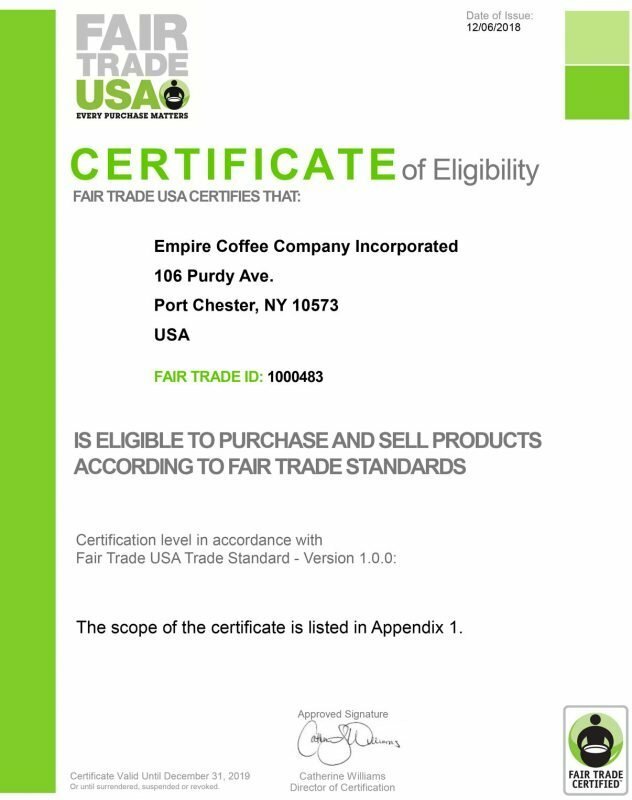 Empire Coffee is certified Fair Trade through Fair Trade USA. Fair trade empowers farmers and workers by providing a base price for their goods. This enables them to invest in their businesses and their communities. 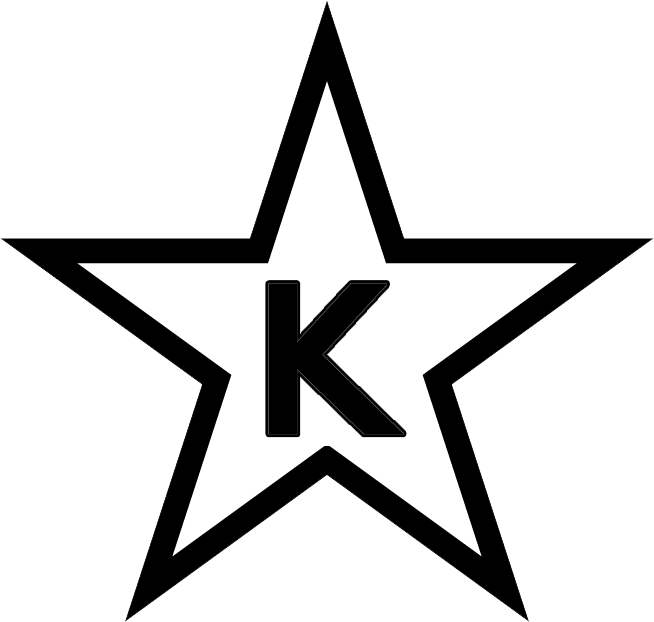 Star-K has been involved in kosher supervision for more than fifty years, ensuring that a wide array of food products are prepared in ways that follow Jewish dietary laws. But it’s also important to understand that many people look for a kosher label who aren’t Jewish. Kosher products are appealing to the Islamic world, vegetarians, Seventh Day Adventists, people suffering from lactose intolerance and celiac disorders, and an increasing number of health-conscious consumers. 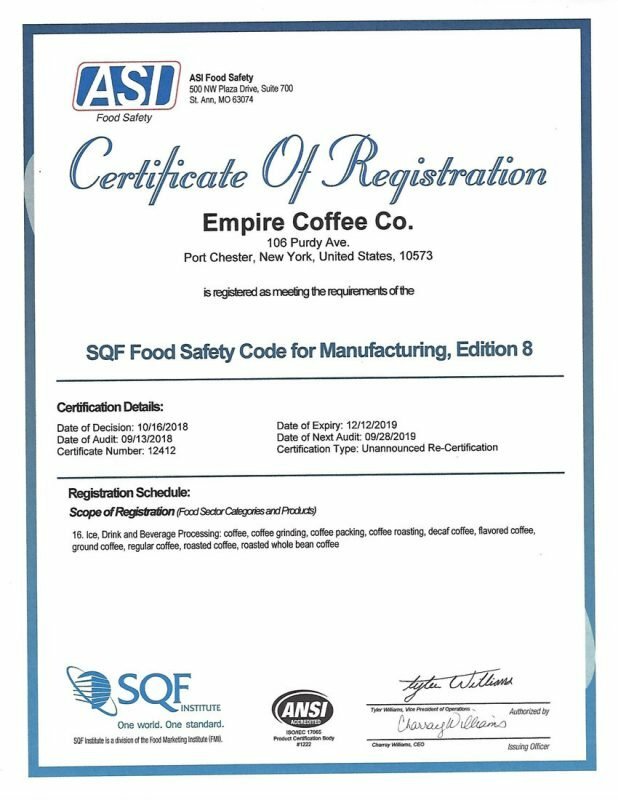 The global kosher food industry is a multi-billion-dollar market that is experiencing strong growth with its rising popularity, and one that Empire Coffee is pleased to serve with Star-K Kosher Certified products. It’s also worth noting that kosher food safety guidelines are considered three times more strict than USDA standards! This certification represents our flavored coffees. 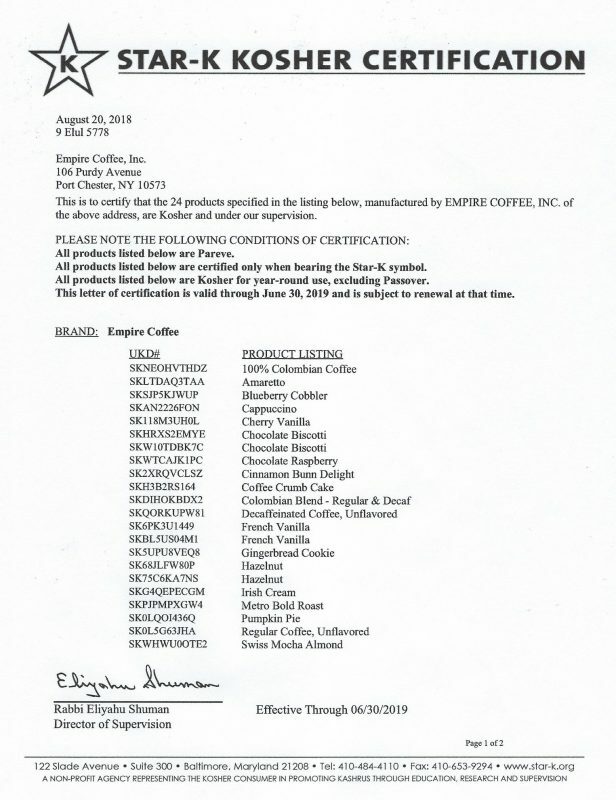 Empire is certified for all coffee including non-flavored coffee. 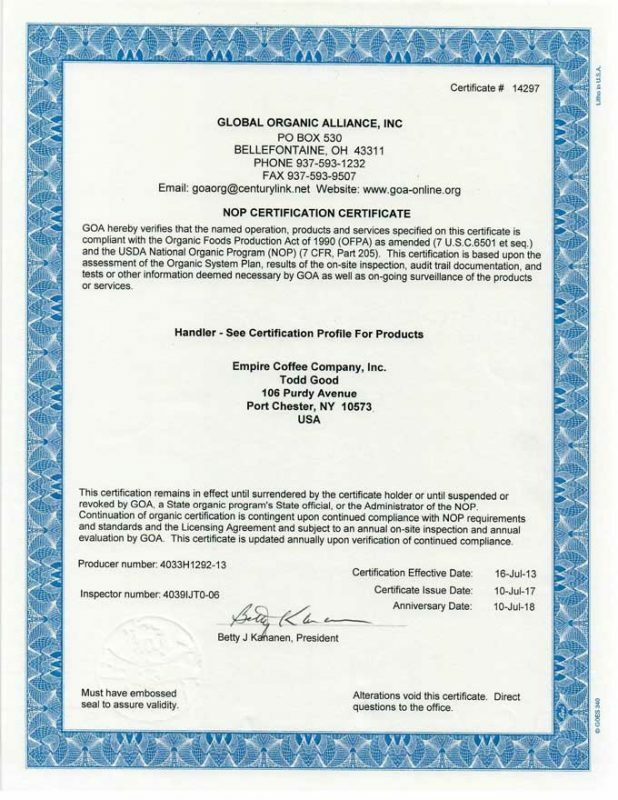 The Global Organic Alliance was formed in 1997 and provides organic certification services that are accredited by both the USDA and the ISO (International Organization for Standardization). GOA follows the National Organics Program standards of the USDA, which broadly means products that are grown and processed according to federal guidelines addressing soil quality, pest and weed control, and use of additives to name just a few areas. Organic producers rely on natural substances and physical, mechanical, or biologically based methods to the fullest extent possible. This means little or no chemicals were used on the crops or soil. And there is widespread agreement that organic coffee simply tastes better than non-organic coffee! Organic certification has become more and more popular among increasingly health-conscious consumers.